When children go to Creative Camp, they come for the arts and stay for the mentoring. 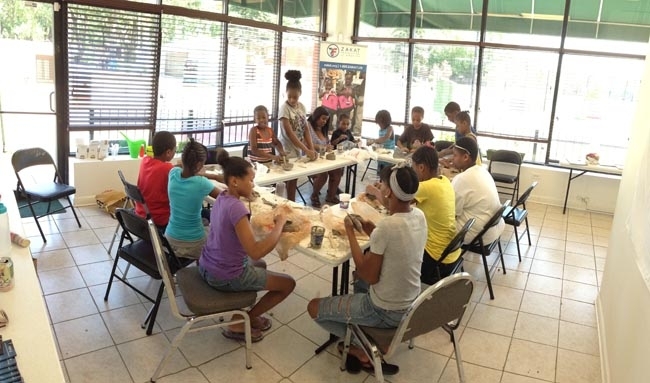 The arts camp at Zakat Foundation of America Community Center Chicago (ZFCCC) started in mid-June and has eight campers ranging in age from nine to 12. They have experimented with a wide range of arts including cooking, painting, writing and even martial arts so far this summer. Amina Demir, a ZF staffer, takes the children on field trips every Thursday, like a trip to Devon Street on Chicago’s North Side, where they ate Indian food and played with traditional Indian toys. Beyond the art instruction and field trips, ZFCCC Director Laila Muhammad recognizes what an important age the children have reached. The security guard on duty at ZFCCC also strikes up conversations with the children, Ms. Muhammad said, and a CeaseFire volunteer has come to discuss the neighborhood violence with them as well. Camp will end in late August, but Ms. Muhammad said that considering the express wishes of at least one young boy, she hopes to hold more Creative Camp events on weekends after school starts in September.